A Pumpkin is a large, orange, spherical squash. In the USA, pumpkins are traditionally associated with Halloween and Thanksgiving and made into pumpkin pie. In other parts of the world, such as Australia, they are eaten year-round, usually as a savoury dish. It is similar in taste to sweet potato. There are many different varieties of pumpkin, and they have slightly different flavours, but the major differences are in the skin colour and the thickness of their rind. Some varieties have a very thin rind which is easy to cut and actually becomes edible when you cook the pumpkin, but as a whole the rind is discarded. Most varieties of pumpkin are at least technically edible. As a rule of thumb, the larger the pumpkin, the tougher the skin and the woodier and more tasteless the flesh. 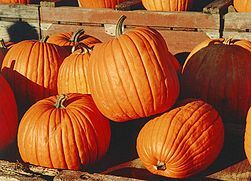 The large orange pumpkins sold for carving in the United States at Halloween are still edible, but they are not as good as pumpkins specifically grown for eating. This is less important if you are making pie, but is something to keep in mind when cooking pumpkins to eat directly. When preparing pumpkin to eat, ensure that you've thoroughly washed the outside with warm water and soap or detergent. This is especially important for pumpkins bought in a 'pumpkin patch', since they may not have been washed before. Although typical large carving pumpkins can taste awful, they are edible. It is always best to use "cooking pumpkins" when selecting a pumpkin which you intend to eat. If you are carving it for Halloween before eating, wash it before you cut into it and rinse it again after displaying. This will cut down the amount of bacteria and fertilizer on the peel. Also make sure to cut off any pieces with wax or soot from candles on it. If your pumpkin has dirt on it, it may be worth it to rinse it off outside with a garden hose before washing it in your sink, to avoid making your sink dirty. If you have a carved pumpkin which you are intending to eat, it would be best to avoid leaving it out for more than 2 days. If possible, carve it on Halloween and bring it in that night. Leave it in a cool, dark place until you cook it. At worst, you would end up with a moldy, rotten pumpkin. If you are lucky, then your pumpkin may just dry out a bit, and you end up with some pieces which are chewy. Either way, best to take down your pumpkin early, or you will have fruit flies! An interesting fact is that most canned 'pumpkin' is actually hubbard squash. Hubbard squash has the characteristic rich orange flesh and bold flavor that users of canned pumpkin will be familiar with. If you are trying to make home made pumpkin pie, you may have found that the taste of 'sweet pumpkins' is not as rich as what is normally found in canned pumpkin. For better results try using hubbard squash. Pumpkin by itself is excellent. To cook pumpkin, slice into chunks no larger than 3"x3", and all chunks must be about the same size. Leave the peel on. Steam in the microwave or on the stove until all pieces are soft and mushy. Then, you can serve directly at the dinner table with butter, leaving it to diners to remove the peel. Alternatively, you could let it cool, peel in the kitchen, mash it up with butter to taste, then heat and serve. If you have a small pumpkin, you can roast it whole - just slice the top off first so that the steam can escape, and roast for about an hour. When it is done you can scoop out the seeds and discard, and if you remove some or most of the flesh you can use it as an unusual serving bowl to hold other food. For a 'poor man's pumpkin pie', after peeling and mashing, instead of butter, mix with sugar, nutmeg, and cinnamon to taste. Serve hot, cold, or at room temperature. For diners on controlled diets, the sugar and butter can be omitted, and still have a tasty side dish or dessert. Without the butter, pumpkin is a very low-fat food, and is also very high in certain vitamins. Pumpkin recipes can be found in the pumpkin recipe category. This page was last edited on 3 March 2015, at 19:48.